These Sticky Sesame Vegan Cauliflower Wings are the best veggie wings I’ve ever had! Loaded with a maple sesame flavor and spice, they are the perfect game day snack for vegans! 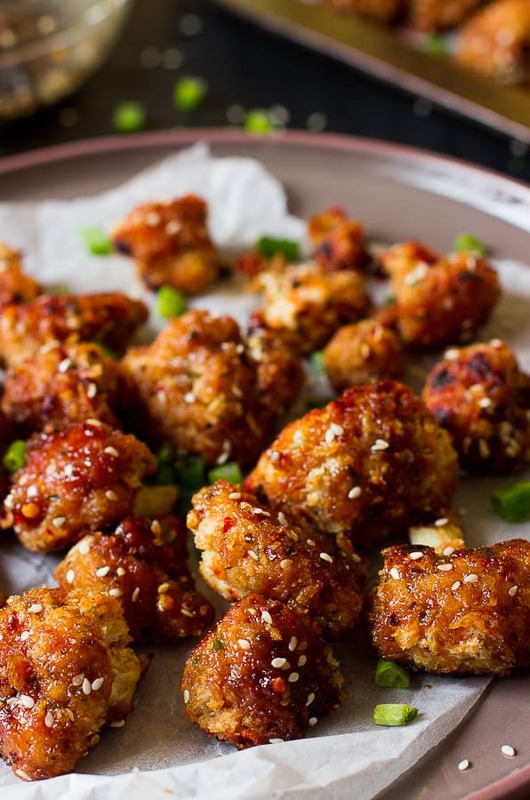 Sticky Sesame Vegan Cauliflower Wings? YES please! Confession time: there would’ve been way more wings in the pictures, but I kind of devoured them seconds after they came out of the oven. Happily so, burning the roof of my mouth and smiling in deep satisfaction. You see, this isn’t the first time I’ve made vegan cauliflower wings, so I knew to expect delicious, flavourful bites of pure sticky goodness. I was SO right. Shall we? With Super Bowl Sunday around the corner, no doubt you’re preparing snacks even if you’re not that into the actual game. Personally, I just go along with the team my husband chooses. It’s pretty ironic since I played basically every sport under the sun from karate to football (soccer) to my all time favourite synchronised swimming. I can watch and get ANY sport within 10 minutes, but for some reason when it comes to American Football I get so wrapped in all the delicious food that it’s been explain to me about four times but all I hear is “crunch crunch”. Oops. I doubt this year will be any different, especially if I’m nibbling on these babies. Vegan cauliflower wings are what have been “missing” from the vegetarian world for years, but are definitely here to stay. They taste JUST like regular wings. Without sauce, they are crunchy on the outside and soft on the inside, and with sauce they are EVEN better. I decided to go with a sweet and spicy sesame sauce for these wings, and they are sticky, soft on the outside, and unbelievably divine. The spice has just the right amount of kick, and the sweet sesame flavour takes it completely over the top. They are great for a meal or as a snack, and the best part? You can show down basically a million of these without any guilt. It’s also completely gluten free, so you can serve these to all your guests despite their dietary specifications. PRETTY sure that qualifies as a touchdown! These wings are also incredibly easy to make. Batter them up, back them, dip ’em in sauce, and bake in the oven for just 5 more minutes. Your entire house will smell like amazing and if you’re anything like me, you’ll be sitting in front of the oven counting down. Promise me you’ll make these? You do not want to miss out on how amazing these are. P.S. who are you rooting for the upcoming games? Q: What can I substitute for the liquid aminos? A: I usually don’t recommend substitutions, but you can substitute liquid aminos for tamari equally. I f you want to substitute soy sauce, I recommend a reduced sodium soy sauce. If you’re using regular soy sauce, you’ll need to taste test the sauce first before putting on the wings and possibly add more maple syrup to balance it out. 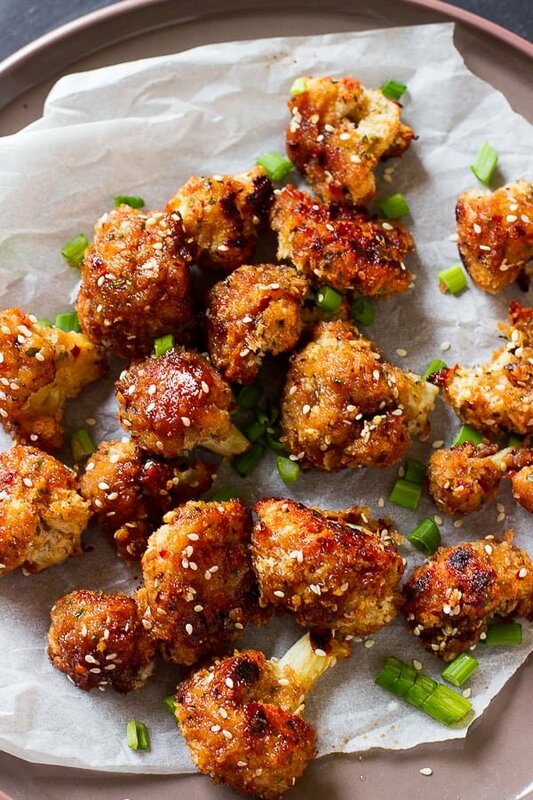 Q: Do I have to make these vegan cauliflower wings with the (gluten free) breadcrumbs? A: Yes! The breadcrumbs makes the cauliflower wings crispy before the sauce goes on, and also means that you can make them sauceless. Ideally, you should make them with panko breadcrumbs which I’ve linked to below. I’ve made these without the breadcrumbs and it doesn’t work without the breading. IF you can’t find panko gluten free breadcrumbs, regular gluten free breadcrumbs will work, just toast them first. Q: If I’m not gluten free, can I use regular flour and panko breadcrumbs? Also, Please Subscribe to my YouTube channel for weekly cooking and recipes videos! Preheat oven to 450 F degrees. Prepare a baking sheet by lining it with a silicone baking sheet or greased foil. Remove florets from the cauliflower (aka don't use the stem). Chop the cauliflower into smaller pieces to resemble the size of wings. In a separate bowl, whisk all the batter ingredients together EXCEPT the bread crumbs. Place the bread crumbs in a bowl. Line it up beside the batter bowl. Toss the cauliflower in the mixture one at a time, shaking off excess batter. Do not soak. Then, dip the cauliflower into the breadcrumbs to coat completely, then place onto the baking sheet. Repeat until all of the wings are coated. Bake for 22 minutes. Please ensure your oven is completely preheated and hot. While baking, prepare the ingredients for the sauce by whisking together. Remove from oven. You can stop here, and serve the wings sauceless with sauce on the side (it is not a very thick sauce). The wings will be crispy this way. Alternatively, coat the wings in the sauce. With a pastry brush, brush the sauce onto the wings. Bake for another 5 minutes for the sauce to soak into the wings. – Either way tastes great, sauce or sauceless, it’s your choice! – Don’t use olive oil to grease the baking sheet since it will burn the bottom of your wings. 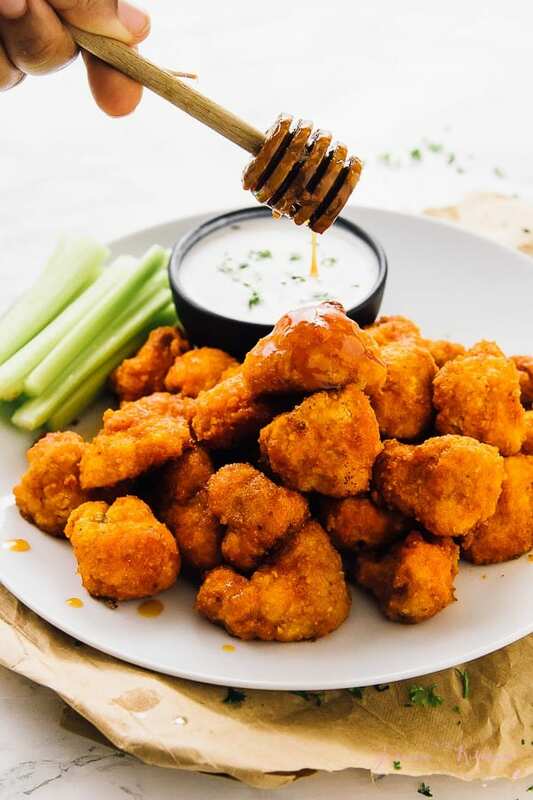 – The batter will only adhere to the cauliflower wings dry. So, if for any reason you wet your cauliflower, it has to be 100% dry for the batter to stick. You can use regular or whole wheat flour if not gluten free. Some Gluten Free flours are thicker than others, so if your batter seems way too thick, add in a few tablespoons of milk to thin it out a little if necessary. I use Bob’s Red Mill All Purpose GF (NOT Baking) Flour. If you want to substitute soy sauce, PLEASE taste the sauce before it goes on the wings first. Some soy sauces can make this too salty. I recommend a reduced sodium soy sauce. 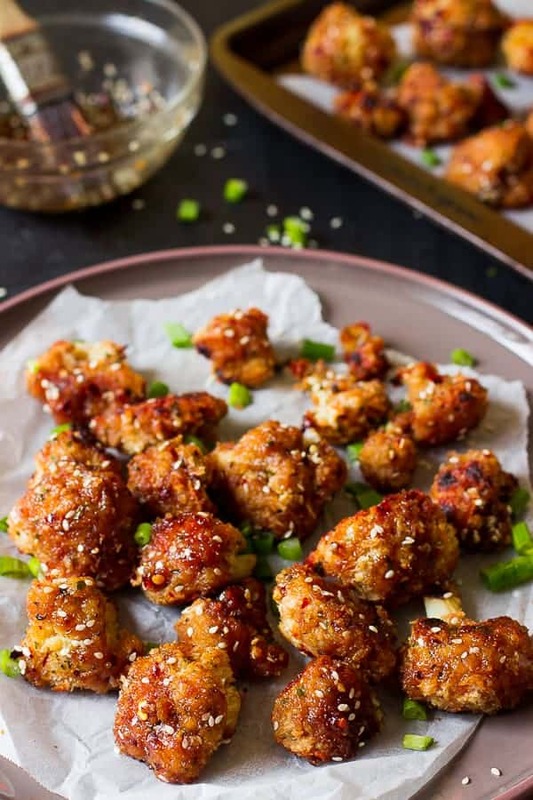 You can store these Cauliflower Wings in airtight tupperware container in your fridge for up to 4 days, and reheat them in an oven until warmed. They taste best fresh. I wouldn’t recommend freezing these as the batter may get soggy. If you try this Sticky Sesame Vegan Cauliflower Wings please let me know in the comment section below, or tag me on instagram with the hashtag #jessicainthekitchen! For more exclusive recipes follow me on Instagram AND on Snapchat: jessinkitchen. Thanks for sharing my link for Sick Chipotle Cauliflower Wings. 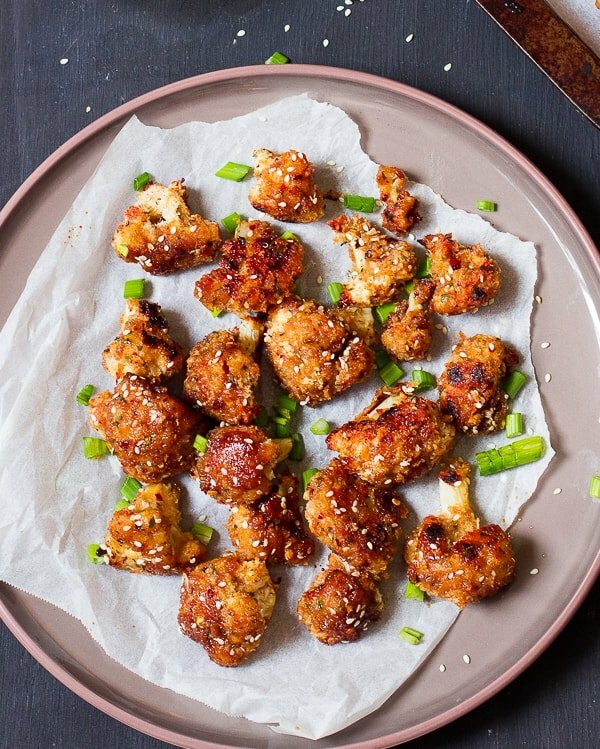 Your Sticky Sesame Cauliflower Wings sound amazing! I’ll take a little of each please! Do you think this would work well with broccoli? I think it should! Good luck!! Great minds think alike – I have a very similar recipes coming soon. I just love them dipped in loads of hot sauce! Great minds think alike indeed Dannii! Thanks! Oh wow! This looks AMAZING, great way to use cauliflower. Oh yes!!! My husband loooooves wings, but I don’t care for meat quite as much as he does so this is PERFECT! I cannot wait to make these! Girl these look absolutely sensational!!!! I want them now! wow these look absolutely mouthwatering! I wouldn’t miss the meat here at all, Jessica. I know just by looking at those that they’re awesome. Nice! Even before I was a vegetarian I didn’t eat wings. But just last night I was thinking what would be a good substitute. Cauliflower is genius & the seasonings sound perfect! Great minds think alike! Thanks Megan! And great won’t-miss-the-meat recipe! Cauliflower is the perfect sub, whenever a meaty texture is desired. These apps look absolutely addictive! Thank you Mo!! The screen I’m working on is REALLY huge so there’s no overlap for me which is why I dind’t realise it was happening. Going to edit it now. Thanks so much! Made these tonight with the sauce. I didn’t change a thing in the recipe and they were terrific! Thanks for the recipe, I’ll definitely make these again. So glad you enjoyed them! Thanks for sharing! These look amazing Jessica! I’m not really into football, but I love “football” food. 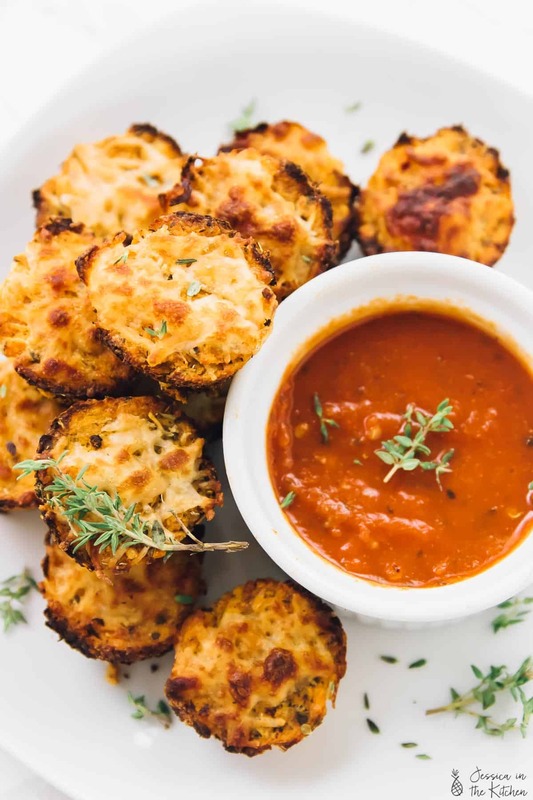 🙂 I never thought to use cauliflower in this way but I need to try this! We’re on the same page! Thanks Alyssa! Gah yes, I need these in my life! I love cauliflower (maybe a little too much?? haha) That sauce!! Haha, I totally get it! Thanks Ashley! Wow, these look INCREDIBLE!! Totally adding to my Super Bowl round up! Delicious! I have to try these right away. I love the flavors in that sauce! These look SO GOOD !!! I love to live with mexican foods, once invisited mumbai @india.. once in a werk i try to prepare it for my family abd they just love it , especially my kids.i have a doubt, can we use olive oil instead of coconut oil used here?? I wouldn’t use olive oil since it can burn easily. I would use vegetable oil then. I would love this recipe but I am unable to find the recipe to open it. So sorry about that! I was having some technical issues, but the recipe is back up! Hi! I was wondering if you could tell me what serving size you based the nutritional info on? I’m making these for myself and recently switched to a vegan diet, I’m trying to make sure I’m getting enough protein. Thank you! The serving size was for about 5 bites, which will not fill you since it’s cauliflower, but simply for the purposes of calculating a serving size to help guide readers. Hope that helps! How important are the ginger and the red pepper flakes? You can leave out the ginger and the red pepper flakes if you want to. The ginger does give the sauce a great flavour and the red pepper flakes give the cauliflower a kick, but if you don’t like/don’t have/are allergic to these ingredients you can leave them out. I would recommend adding another spice element (maybe hot sauce?) since the spiciness of these wings really contributes to the flavour. I do need to say that I can’t speak exactly to the taste of the sauce without the kick of the ginger or the wings without the kick of the spice so I can’t guarantee exactly how they would taste, but I doubt it would make a huge difference. I hope you enjoy! These are great! They are great texture and look like the pictures 🙂 I substituted soy sauce for the liquid aminos but will stay true to the recipe next time because the soy sauce made the wings too salty. I’ll follow the recipe next time 🙂 Thanks for sharing! Thanks so much for your feedback! I’m so glad that you enjoyed them! Yes soy sauce is way more saltier than liquid aminos. I’ll add a note in the instructions to not swap. You’re very welcome! What could I use instead of liquid aminos? You could use tamari or soy sauce, but taste it before it goes on the wings because they are saltier than liquid aminos. You may need to add some more maple syrup to balance out the saltiness. Hope that helps! I’m so glad you enjoyed it!! Thanks so much for sharing your feedback! The cauliflowers were great until I put on the sauce which was way too salty. I tossed some in Frank’s hot sauce instead for buffalo cauliflower bites. They were a big hit! Omggggggg!!! First time making cauliflower wings I’ll admit I was skeptical but Whewwww I think this will be a staple in my house. I’m SO happy to hear!! I’m thinking of making another cauliflower wings recipe later this year! 🙂 Thanks so much for your feedback! We had these tonight for dinner and they were a hit! Having cauliflower tacos later this week and will try to remember to take a picture. We have loved everything we have tried so far. Coconut curry chickpea recipe is in our regular meal rotation too! SO glad you enjoyed!! So glad you’ve enjoyed everything so far too 😀 thanks so much for your feedback!! I just made these for my sweetheart to eat while I’m at work tonight, and I just had to taste test one. They’re DELICIOUS, I’m considering taking them all for myself and pretending they never happened, haha. Thank you for a wonderful recipe! Yay! So glad you enjoyed and I hope your sweetheart does too (IF you share them haha!). Thanks so much for letting me know and you’re so welcome! I’m a bit confused regarding the breadcrumbs? You mentioned in the questions that it’s necessary to use Panko crumbs but the ingredient list mentions gluten free breadcrumbs. Which is it please? Okay, so the gluten free breadcrumbs that I linked to are panko breadcrumbs, so I was using them interchangeably. So yes, it’s gluten free panko breadcrumbs. If you aren’t gluten free though, you can definitely just use regular panko breadcrumbs. IF of course you can’t find panko breadcrumbs, regular breadcrumbs are fine but just won’t be as crispy. Q: Do I have to make these vegan cauliflower wings with the breadcrumbs? Personal touch – I added a bit of soy sauce, onion powder and sesame oil to my wet batter. I also used panko (all I had) – made a super light but crunchy coat. 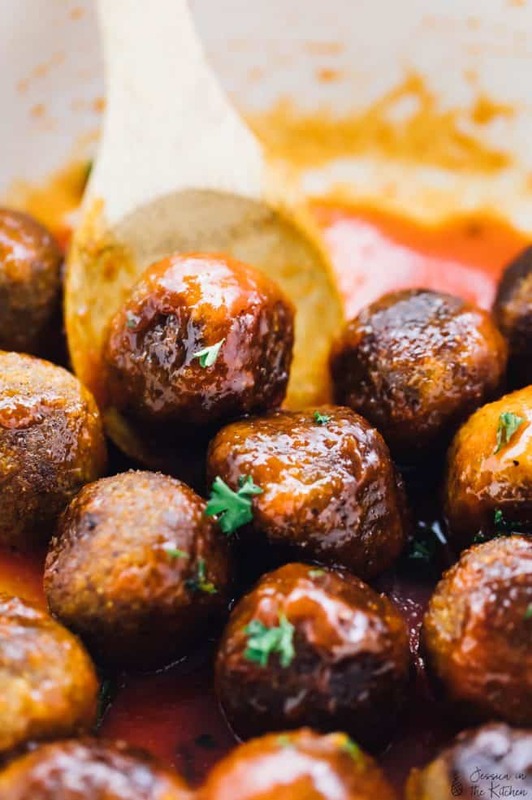 These are banging and will be in my weekly dinner rotation – cannot wait to try with different sauces. Jessica – I have NEVER commented on anyone’s recipe before and I’ve made some delectable dishes. This recipe had my husband smacking his lips looking for more! This is a keeper and we BOTH thank you a gazillion times for sharing it! Hi Ali, Happy New Year! I can’t believe I missed your comment. You’re SO welcome!!! I’m SO glad you both enjoyed this so much :D. Thanks so much for your feedback! You’re so welcome and thank you! I hope you enjoy! I just made these and they were AMAZING. I made extra sauce so that I could dip each “wing” rather than use a pastry brush. These will definitely be making an appearance at my next party. Thank you!!! I’m so glad to hear that!! Oh I love that idea – I have to try it too! Thanks so much for your feedback and you’re very welcome!! These sound amazing. I can’t wait to try them. Thanks Amanda! I hope you enjoy!! These were a hit with my boyfriend and I! I did use soy sauce, but only one tablespoon, and it seemed to do just fine. By chance, I also used garlic powder instead of ginger powder in the sauce, but they were still delicious! Thank you very much for the recipe. I”m so happy to hear! Glad your soy sauce sub and garlic powder sub worked too! You’re so very welcome and thanks so much for your feedback!! Made this recipe last night. Delicious! I’m so glad to hear that! You’re so welcome and thanks for your feedback!! Hi, Jessica! I just made these wings tonight with a few little tweaks. SOOOOOO GOOD!! Thank you for this recipe. I will be sharing my tweaked version – and crediting you of course – in my own blog. Great recipe. Hey Audrey, I’m SO glad to hear you enjoyed these! Thanks for your feedback! I just made these for dinner tonight. They were so delicious! I couldn’t quit eating them. My husband loved them too. I will most definitely be making these again. Thanks for the great recipe! So glad to hear you both enjoyed them!! Thank you so much for your feedback and you’re so welcome! Hi Jessica – Could I substitute skim milk for the unsweetened almond milk? Just made these for lunch, I loved the flavour! Thank you for the wonderful recipe. Yum! So glad you enjoyed Cassie and thanks for your feedback! What is the soy sauce for? I read in notes about using it but don’t see it in the ingredient list or the instructions? If you want to sub it for the liquid aminos! So glad you and your family enjoyed them so much! That’s so weird, that sogginess has never happened to me before! Thanks for your feedback! Oh haha I am SO happy to hear that! Yes waiting to share is always the hardest part haha :). Thanks so much for your feedback!! Tried my hand at this recipe and they were DELICIOUS! I just need to work on making mine more “sticky” lol. Thanks for the healthy finger food recipe girl! Thanks so much for your comment darling!! You’re so welcome <3 <3! I just made these for the week and it was AMAZING! I just went vegan recently and I heard that cauliflower could taste like chicken. Boy oh boy, does your recipe taste like chicken! Thank you so much for it and I will definitely continue to use it! Tried this recipe tonight and it was delicious!! I think this is the healthiest way I’ve found to make cauliflower wings. I love how crispy they came out. I made half the batch adding the sauce and cooking the extra 5 minutes, and half batch I left out of the oven and dipped. I really loved both! I loved the extra crispiness of the dipping batch, and I loved how the sauced batch soaked up the sauce just a little bit more. My husband wasn’t crazy about the sauce but I think he’s not into ginger as much as I am in general. He said he loved the non-sauced wings and next time he will try dipping them in bbq sauce. I loved the sauce and everything about this recipe. Looking forward to checking out more from your site. Thanks so much! These look amazing!!! Can’t wait to try! I just made these and my husband and I agreed that the flavor was complex and delicious. I basted the sauce on after the 22 minutes and put back in the oven for 5 minutes. They did not have the carmelization that yours appear to; rather, it appears as though the sauce simply soaked in. Any recommendations on how to resolve this? I used gf all purpose (not baking flour) and believe I should have thinned out the batter a bit, but apart from that, I followed the recipe. I will make these again but just want to improve the texture a bit. Thank you for this post! Now I am going to make your chocolate avocado no churn ice cream. Yum! Where would you buy liquid aminos? These look awesome and I wanna try them out! Do you think you can substitute any non-dairy milk in for almond milk, or should it be almond milk? Yes you can sub that! I hope that helps! Made these last night. The cauliflower was so crunchy! I really enjoyed the sauce which I left on the side for dipping. My husband and sons decided they enjoyed dipping theirs in hot sauce better. This was definitely a win in my family book! Thank you Dale!! We’re so glad you and your family enjoyed this! Hi! Can you sub almond flour for the all purpose gluten free flour? Or what other flours would you recommend? Hey Anna almond flour would be a bit too mealy. If you’re not gluten-free you can definitely use regular all purpose flour. We hope this helps! I really want to make these for a party appetizer. After making them, do you think they will keep well in a crock pot for a couple hours? Do you mean in a crockpot that is on? Yes, I would keep the crock pot on low so that the ‘wings’ stay warm throughout the party. I just wanted your opinion if you think the texture will not keep well. Thanks in advance! I haven’t tried a crockpot, but I have kept them in an oven at a very low heat for about 30 minutes. Maybe test these out before the party to see how they work for you? I hope that helps! These are delicious. I made them this evening. My 18year old dog is finishing up my plate and he loves them too.❤️ Thanks for sharing! I was very skeptical about the idea of cauliflower wings.. But I had a cauliflower there that I needed to use up so I thought I’d give them a go. Absolutely love this recipe and it will most certainly become a firm favourite. Oh wow thanks so much Megan!!! 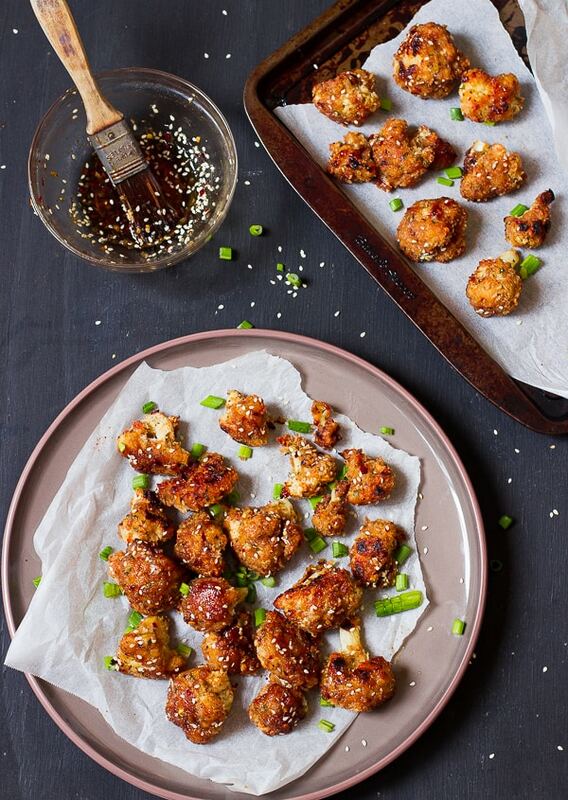 We’re so happy that you like our recipe and that you’re a new fan of cauliflower wings! Going to an engagement party- how long are they tasty goody if sitting out on table? Hi Tracey These can definitely stay for about 2 to 3 hours uncovered and will still be great! I hope this helps!! I don’t really like cauliflower but I must say I loved these and ate all the leftovers my husband didn’t want, Yum. I did tweak the sauce a little to my personal taste and used low sodium soy sauce instead of aminos, no problems. I know you don’t recommend freezing them, but I assume that was after cooking. I wondered if you had tried battering/panko crombs, then freezing? Sort of making them ready to bake more or less. I have a cauliflower that needs cooking immediately and thought I would give it a try. Thanks for the recipe. Best cauliflower I ever ate. I’m so happy that you enjoyed! Sorry I’m just seeing your comment. I haven’t tried freezing them that way but I do like the idea. If I try it I will definitely let you know! I’ve made a few cauliflower wing recipes, but these were by far the best! So good! Would definitely make them again. So happy to hear this Stacey!! Thanks for your feedback!! Yay I’m so happy to hear this!! <3 Thanks for your feedback! Thank you so much! So happy you enjoyed!!! Thanks for this super yummy recipe! These were so delicious, even my carnivore son and husband ate them and said it was the best tasting cauliflower they had ever had! A couple of notes I have made for next time…. My ‘small’ cauliflower obviously was a lot bigger than your small one so I needed to double the recipe. No problem…that just meant I had twice as much of this yummy recipe. Next time I think that rather than pouring the sauce on and returning to the oven, I might put them in a wok and pour the sauce on them in there so they get properly coated with it. Not sure how that will go but I am going to try it. I have to say, this was one of the tastiest ways to eat vegetables. We didn’t have enough cauliflower so we substituted a little with broccoli. This meal was just gorgeous. Kids enjoyed it too. Thank you so much. Aww I’m SO happy to hear that Dee! Thanks so much for sharing with me! I could not find fresh organic Collie flower at the grocery store. Is it OK to use frozen? I would assume that the cooking time is reduced. Hi Dominica. Frozen cauliflower can be used. It’s hard to give an exact time (roughly 5-10 mins) because it depends on the size of your particular frozen cauliflower but I suggest putting the frozen cauliflower in the oven at the same temperature of the recipe, this is to remove the moisture. Pat the cauliflower dry with a paper towel. Once this process is done you can follow the recipe. I hope this helps! I am so excited I found your blog! This recipe is absolutely divine with TONS of flavor. I paired it with Jasmine rice. I’m not a vegan I’m incorporating plant-based recipes to follow a plant-based diet during the week and it has been fun finding recipes to experiment with. Your blog is what I needed in my life and consistently suits my taste palate. I cannot wait to try your future recipes! Aww I’m SO happy to hear how much you enjoyed this Keyshia!! So cool that you’re incorporating plant-based recipes too. Thanks so much for sharing with me and I hope you enjoy future recipes too!! My first visit to your web site. I made Sticky Sesame Vegan Cauliflower Wings, and followed the recipe “almost” exactly. I used regular flour, soy sauce. and honey instead of maple since I don’t mind using honey. They were so incredibly good!! You really came up with a winner with this recipe. Thanks so much Owenna! We’re so glad that you found the recipe to be good! Thank you so much for reading!